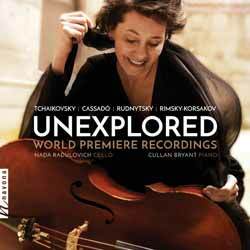 For fans of traditional classical music, the pieces on Unexplored are essential listening. Not only are the works chosen diverse and emotive, but the performances see the players pour their heart and soul into the recordings. It's pretty obvious that Nada Radulovich (cello) and Cullan Bryant (piano) have an affinity with the material as their performance feels like two people who are incredibly fond of each note of every piece. Tchaikovsky’s 'Six French Songs, opus 65', dedicated to Madame Desirée Artôt de Padilla. Cassadó's (1897-1966) Sonata of 1924, is a four movement work dedicated to Donna Giulietta von Mendelssohn who was said to ‘sing like a mermaid and play the piano like Liszt’. This work, presented here for the first time, represents various moods and dances. At times poignant, dramatic, playful, or uplifting, it is an effective synthesis of tradition cast in striking harmonic terms. 'Romantic Fantasie for Cello and Piano, Op 43', by Ukrainian composer Antin Rudnytsky (1902-1975), displays a conservative 20th-century harmonic language, while exploring the folk idioms of the composer’s native land. It was also while listening this that I realised that this is probably the main inspiration for John Williams's score for Schindler's List. One of Nikolai Rimsky-Korsakov’s best-known works, 'The Flight of the Bumblebee' closes the album. This unique transcription of the work was created by pianist Bryant in his effort to remain true to the original score, and was inspired by his years of collaboration with Radulovich. A truly beautiful release which is diverse and incredibly well produced.